Use "Undelete" mode to recover deleted ISO files . Use "Unformat" mode to recover lost ISO files after format hard drive . Use "Recover partition" mode to recover ISO files if hard drive partitions changed or damaged or deleted. Use "Full Scan" mode to recover lost ISO files if partitions show as "raw" or recover deleted ISO which can not be found with "undelete" and "unformat" and "recover partition",recover ISO files from raw partition,recover ISO files of partitons which are not NTFS,nor exfat,nor fat32. ISO file is actually a CD-ROM image file, burning software can burn the ISO file system can be installed disc, ISO file iso extension generally. Also you can use ISO files like a disc, so that you can use it to load a program. As a data file, If you have deleted an ISO file, there is a chance you can recover it with a file recovery software. After few step you will get your lost, formatted, deleted ISO file back. Aidfile is the best data recovery software which can recover the formatted, lost, deleted iso file. If your iso files that be misdeleted formatted. Aidfile can help you recover the lost iso file files. 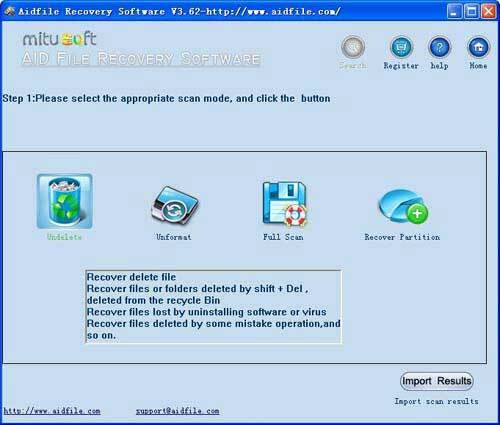 You can use Aidfile recovery software to recover the deleted iso file files easily. Aidfile is a powerful data recovery tool for recovering files from deleted/formatted/repartition/missing drives/partition table damaged etc. How to recover iso files ? Select the "Recover Partition " or "unformat" or "undelete" or "full scan" to recover iso files.